Originally focussed on writing, and reporting on foreign lands, in 2004 Marc Lathuillière began a career as an artist, with a practice that was based mainly on photography, being influenced by his education in the political sciences and by an anthropological approach to the real, his principal project, Musée national, is a vast critical inventory of France and the French. For thirteen years he photographed over seven hundred people throughout thirty five departments, with a great many of them being in the Puy-de-Dôme. This endeavour takes the form of a series of contextual portraits in which the subjects, from the craftsman to the elite, all wear the same mask. This set up unsettles the vision that we may have of the link between the French, their patrimony and the construction of their collective memory. By fixing it in time, by freezing it, the mask does effectively bring into to doubt the hidden face of representation: costumes, furniture, architecture, landscape, and professional or domestic gestures. In this way it manifests the movement of museumification that is at work in French society as much as the role of the image in the identitarian closure that this process induces. At a time when a fifth of all jobs in France still reside in the trade sector, these occupations have largely lost their visibility, just like the men and women that do the work. The current debates around de-industrialization indicate that the perception of industry is shifting further and further towards the notion of patrimony. Through his portraits, and the Fabrique nationale exhibition, Marc Lathuillière places the idea of work at the heart of our questions concerning the relationship between origins and future: memory work, suffering in the birthing of an identity, whether it be individual or collective, but also work as value and projection, and ultimately, fear of its devaluation and its loss. To this end, the artist plays with different forms of display, aiming to interpret the site of the Creux de l’enfer, a cutlery factory that has been reconverted into a centre for art, like an ancient temple of belief in industrial progress.Marc Lathuillière, the face of a being of conjuncture. ML: Though a whole section of my series is dedicated to holidays, it is mainly the staging of work that holds one’s attention. It is perhaps that, even in leisure, man remains Homo faber above all: he works on the real, and on his image [...]. This brings us to the functions of the mask in antiquity. And to the first among them: the head of the Gorgon. It is not worn over the face, but ever since Perseus sliced it off, it has been endlessly represented on canvases, shields, even on courtroom doors. In his essay Méduse, Jean Clair analyses the recurrence of this figure in western art. 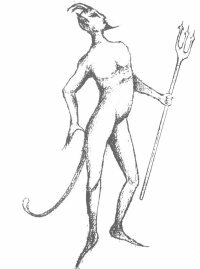 For him, defending access to Hell, Medusa signals the forbidden, or at least danger, something that can be seen over one’s shoulder: turning towards the Chtonian world of the past and of our origins. I would add: towards one’s roots. To envisage this is to risk becoming petrified. Man is thrown forward and can no longer return to the maternal womb. Only the artist, through his optical ruses can, on this level, confront Medusa: Perseus, the first among them, did this by looking at her reflection in the shiny surface of his shield. It pleases me then to imagine Perseus as the inventor of photography. He duplicates – in other words he masks the real – freezing it so as to better slice into it. FB: Since you are referring to antiquity, it should be remembered here that the heroes of the Greek drama displayed the accentuated traits of their personality on their masks: the image of an entity that asserted its own individuality in relation to the community. For Mikhaïl Bakhtine – close to Rabelais in this – the mask is the attribute of the carnival, an outlet in an expiatory context, each one of us escaping the sometimes alienating tasks of ordered life for a few days. In Musée national, the smooth mask validates the image of photographic paper that catches and holds light, regulated like a diaphragm with two focusing irises, fine tuning and vanishing point. It is towards this that the cluster of visual clues converge and comes to be fixed: the being in its bodily gestures, the being of trade, the being impregnated by its landscape and its décor. The model’s view turns towards the photographer: it is he who orders, controls, orchestrates; it is he who imposes the mask. This mask, in its formal essence, attempts to disincarnate individuality to then reincarnate it in another objectivity, not in the face of a being freed from without, but rather on the contrary in that of a being shaped by its context; in short, the masked face of the postmodern being; that of a being of conjuncture. 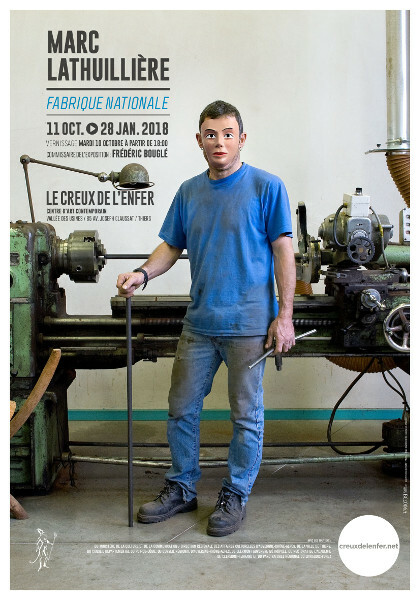 Fabrique nationale has been part of the Tour de France of the Musée national exhibition for a number of years. Partners: L’imagerie (Lannion), Les Ateliers de l’Image - Centre Photographique de Marseille, La Friche La Belle de Mai, Le Creux de l’enfer, the Galerie Binôme. With a number of group exhibitions in 2017: L’œil du collectionneur, the Strasbourg Museum of Modern and Contemporary Art, Paysages français, at the BnF, Paris. For Musée national, Marc Lathuillière benefited from a number of residencies, including two in Auvergne: at the CoLLombier (Cunlhat) in 2007-2008, and with the DRAC Auvergne at the Lycée Roger Claustres in 2010-2011. The project became known in 2014 thanks to an exhibition at the Galerie Binôme that was part of Photography month in Paris. Accompanied by a text by Michel Houellebecq that was also the preface to the catalogue published by the éditions de La Martinière with support from the Creux de l’enfer, it was placed in a process of dialogue in the Le produit France set up, with an exhibition of the writer’s work being curated in parallel by Marc Lathuillière. Thanks to: Valérie Fougeirol, Erick Gudimard, Jean François Rospape, Alain Arnaudet, Michel Houellebecq, Marc Augé, Marc Bembekoff, François Saint- Pierre, Valérie and Jean Marc Seguin (Fondation Seguin), Jean-Pierre Debard, André Chassaigne, Louis Faivre d’Arcier, Christian Doradoux, Amandine and Cédric Fayet-Dauduit, Thierry Déglon, Dominique Lazime, Robert Nicaise, Héloïse Conesa, Michel Poivert, Thierry Vaast, Nina and Jean-Claude Mosconi, Delphine Renault-Jouseau, Ophélie Jouvenon, Marie-Astrid Rolland, Henri Viallon, The Ateliers Machefer, Gilles Testard, Lucie Savoye, Jean-Jacques Dubernard, Joachim Boitard, Philippe Bosc, Alexandra Balloré, André Lorcerie, Marc Gourdon, Matthieu Degut, Stéphane Alziari.